Shaanxi is an undeveloped province, with enormous potential, and it is a pivotal area for several reasons. Firstly, Shaanxi is an important transportation hub, with highways connecting the east to the west, the south to the north. Secondly, Shaanxi is one of the areas in which China as a nation was born, with numerous heritage sites, and endless resources for tourism. 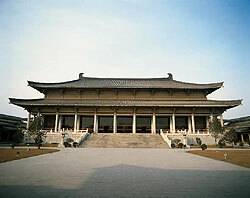 One must-see is the famous Tomb of the Terra Cotta Xian Warriors. Other notable places are the Daqin Pagoda, Banpo Neolithic village located near Xian, and of course, the beautiful ancient city of Xian, one of China’s great ancient capitals and a stopping point on the old trade route known as the Silk Road. Shaanxi also has numerous scenic spots, such as the Qinling National Environmental Preserve and the waterfall in Hukou.